I've also upgraded the stats sheet, especially as regards the ability to show HD used as opposed to just a "head-count." It works a lot better. That was my other weekend project. Stonewall is another pretty interesting part of Alphatia! The only thing I remember about it is that it is fairly tolerant towards Fighters and Thieves and that there are alot of Temples in this Province. Draco also sounds like an intriguing metropolis. DotE says it is the largest city in the Empire, but I guess that is changed now? I like to see Halflings (10%!) as part of the population! :) Would these be immigrants from Leehashire or the Five Shires. Or both? I could see cities down south of Alphatia as being among the largest -- any city in Haven, Arogansa, Randel, etc. which have very large plains. I can't see any good reason (geographically) for Stonewall to have such a high population. It's not a big province and it is rather isolated from the rest of Alphatia. I'd think Halflings would be mostly immigrants from nearby Stoutfellow. Hmmm...if there is a hin population here, perhaps they speak Lalor, in whcih case there may be a hin settlement or two here with a "traditional" hin name. It would give the place an eclectic feel. Love the names of the forests! Filchfall Forest sounds like the kind of place where either an infamous thief met his/her demise, or a great plot to steal a magic item of great worth (maybe the crown of the King of Stonewall) was foiled. I see the potential for something nasty to be located here. Likewise, the Greyhags Fens reminds me a lot of Carl Quaif's article in the Vaults on the Darokinian Sisterhood of the Fens - a coven of swamp witches. What secrets might they hold? Why *is* there a stretch of swampland there? An idea: Centuries ago a cruel noble lived there, and tried to stomp out traditional witchcraft (brought over by spellcasting colonists from Brun). The witches organised themselves and destroyed the noble - and his entire estate. The river flowed into the newly-created pit, creating the swamp. The witches either live there in secrecy, or they have long since vanished or moved on, but the locals remember them and give the place a wide berth. Overpopulated Stonewall figures have been posted. Interesting. I think I prefer the bigger numbers - they have a little bit more of a story to tell. I agree that quality of life in Stonewall may not be that great, but that is the price of escape from persecution, right? It's a peculiarly Alphatian situation, which can only be a good thing for us designers. 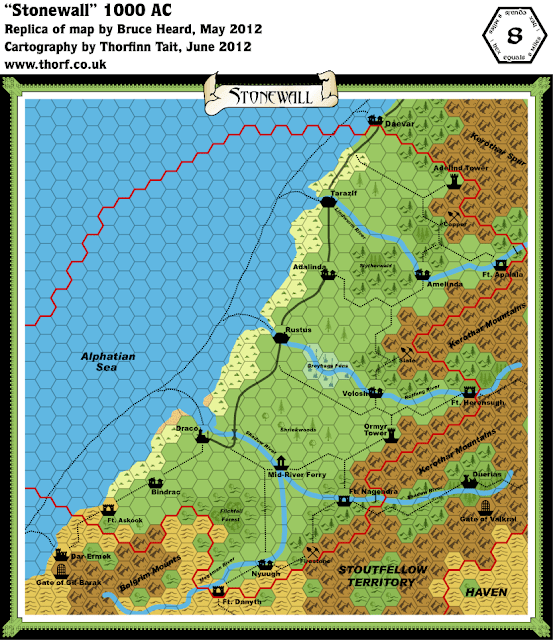 I just posted the Draco closeup map. The city spills out of its 2 mile hex to cover almost all of the adjacent hexes. And this implies multi-level buildings of course. If you actually decide to do this one, feel free to replace some of the resources with sheep and pigs (if you have the symbols) on the south side of the river. You can add a few more. I'm assuming that much of the farming population around Draco includes a majority of manure-smelling halfling immigrants. The little houses are supposed to be hamlets. The brown trail symbols denote narrow dirt roads (as opposed to the well-traveled trail from Draco to Bindrac.) The gray-colored road is paved. I threw in some windmills. Hope you won't have too much trouble with them. And of course, the scale is 2 miles per hex. Hmmm... How about a compromise solution to the population problem that makes Draco a little smaller so that Stonewall only just scrapes by without importing food. With the new population density figures it could still be reasonably big without causing such a drastic food deficit, couldn't it? In strict real world medieval terms, the ratio of rural population to urban was 9 to 1 (it's the exact opposite in the 20th or 21st centuries.) I'd upped that figure to 8 to 2 because of the presence of "magic." My original Stonewall stats were for a "just scraping by." Yes but your original stats also had far more borderlands and wilderness, right? What size of city would your new population densities be able to support? Sounds good. I think we should go with the compromise and maintain the integrity of your population density system while keeping to the spirit of the original figures. Is it still too much for your liking? 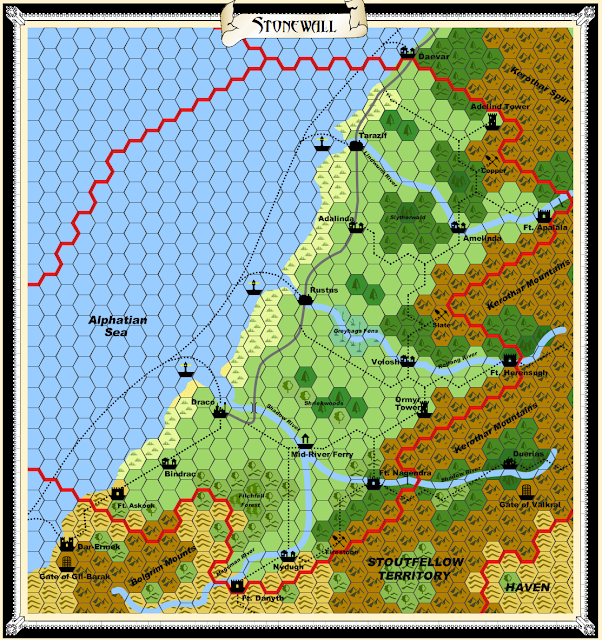 The only problem I can see is that the population density is likely to be much higher in Stonewall than surrounding areas, but this can presumably be explained by the large numbers of non-spell casters living and indeed constantly trickling into Stonewall. The figures are still quite inconsistent from a regional point of view (I'm not quibbling--I'm just pointing out.) Just to give you an idea -- London in the early 13th century had about 100,000 inhabitants, 200,000 for Paris, which was the biggest Western European city, 350,000 for Constantinople. Meanwhile, Draco isn't a major capital city. It is a provincial city in a relatively hard-to reach spot (from the rest of the mainland) in a continent/island smaller than real world's Western Europe. Granted some people might see it as a place where they might have more rights than the norm, but they're really switching from being ruled by aristocrats (like practically all other nations on the planet--so what's the beef with that anyway?) to being ruled by a pack of thieves. Bit out of whack, I'd say. Gee, I just realized, this sounds like modern day USA. LOL! That's not quite a fair comparison, because the laws are really much more severe in Alphatia for non-spell casters than they are for commoners elsewhere. That said, to be honest the official info on Draco and indeed Stonewall is so scant that I would be happy with whatever you decide to go with. 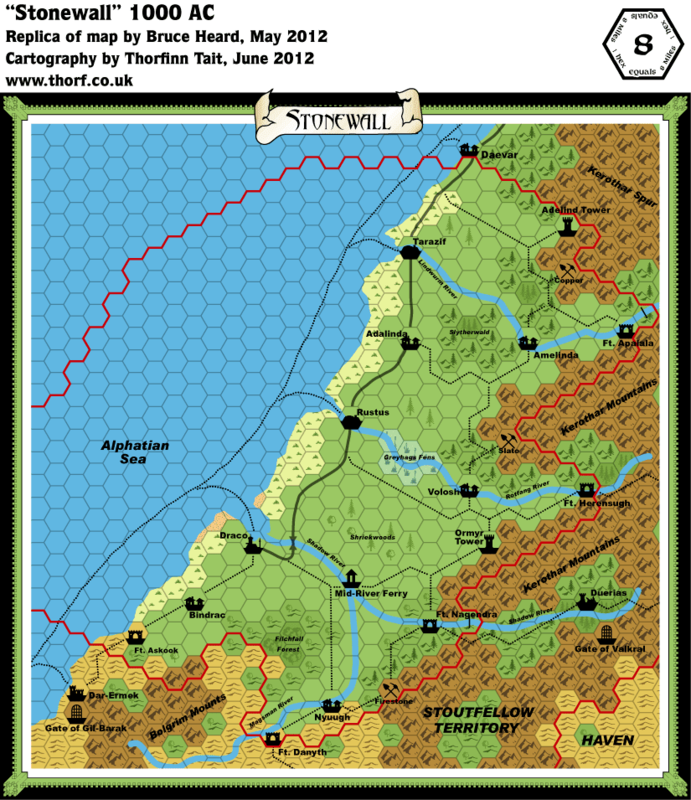 And you're probably right to err on the side of consistency of demographics - after all, the Mystara community as a whole has always been a bit of a stickler for realistic demographics, despite the high magic level of the setting. So... I suggest you choose whatever setup you like best and go with it. But leave the other stats you've come up with as a choice for those who favour the Dawn of the Emperors numbers - however inconsistent they may be. This has turned into a tiresome and pointless discussion, Thorf. I'll do what I think is right. If people don't agree, they can follow DotE, their own campaigns, or what works best for them. Wasn't that always the case anyway? I couldn't agree more. Looking forward to the next map. Bruce, maybe we should think about getting you somewhere more permanent where you can post these statistics and so on. The blog format is nice for presenting, but not for looking up again later. 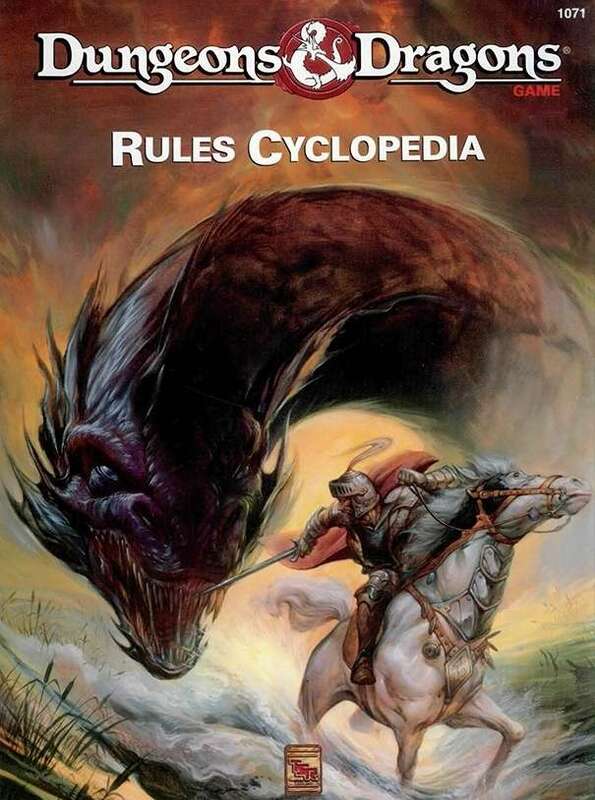 Would you be interested in posting the stats on the At.as of Mystara Wiki? The maps are already there, and I plan to post them there eventually anyway. You can have full editorial control, and I can help getting the framework in place to make it a smooth processs. Let's wait a little before doing this. Okay. Let me know whenever you're ready. The Stonewall replica map is done! I created a new portcullis-like gate symbol. Let me know what you think. The coastline only took a little revision to match it up with the original map - basically there was about a hex of land missing all along the coast. But I kept the river mouth bays from your map, which has made all the towns appear slightly recessed. I don't really know if it's good or bad. 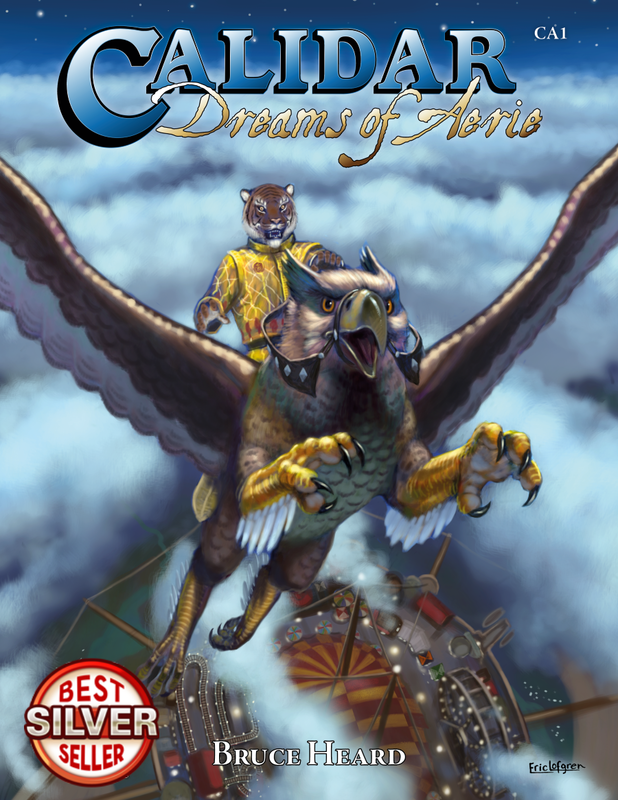 Added Draco's city summary to the post.